5 Brilliant Ways To Earn Money Online | GUI Tricks - In Touch With Tomorrow! 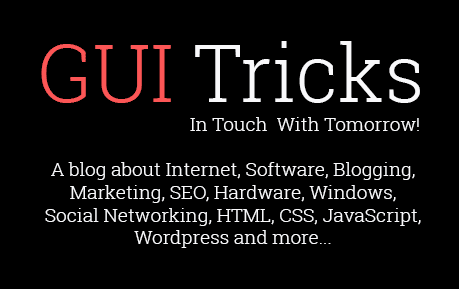 5 Brilliant Ways To Earn Money Online - GUI Tricks - In Touch With Tomorrow! In today's era, making money is becoming very difficult. We have to face many challenges then we earn some money. But as we know, its 21st century and the world of internet is growing very fast. So why should we not earn money through it? If you're an internet user, but wasting your time on social media or playing online games then you're a fool. You can earn money via internet too. You know what, due to the rapidly growing foundations of technology, it has been so much easier for people in today's era that every age of people can make money via internet. You can also, but for that skills matter the most. Well! there are several ways for making money. But below are some recommended ways that are suitable for every type of user. Actually, the purpose behind to share this post is just that people who are unemployed or free at their homes and wanna earn money, so internet is really best for them. Try some below brilliant ways to make many via internet and must share this article. I hope, this article will help to grow awareness about the importance of internet. So guys here are some ways to earn money through the internet. But I think, a question should some in your mind that "How much can I earn money?" If you've this question, that's great. Actually, there's no limit. You can earn 1$ per day, even $100 or sometimes you can also earn $1000 per day or per month finely. So there's no limit for that. It depends on your work, I mean hard work. The more work, you do then you can earn more. After read title of blogging, most people may be thinking about it. What's blogging or what's that etc. I know, almost 70% of people are not aware about it. But believe me, there's no any best way on the internet to make money. This is one of the most excellent way to earn money online. But what is blogging? Here's a short definition. "Each and every skill you need to run and manage a Blog is called blogging. Blogging includes Skills Like Search Engine Optimization, Social Media Marketing, Writing, Editing and Publishing Posts, Designing and Maintaining the Design of your Website, etc." So, if you think that you can manage a blog finely, then you should start blogging. I know, it may be hard and lots of newbie will do such mistakes at start of blogging that might be harmful for them. But remember, if you've a dedication and hard work then you can do everything that you want. So create your own blog and start blogging from today. Here's an article link of quick guide to start blogging for all beginners. Yes! It's true that Blogging is not easy. It's very difficult for all those who didn't ever do this. Because we have to learn about it first then we can manage a blog, otherwise no benefit. But working as a online author is also best. If you think, you're good in writing articles then you should work as an online author. You can contract with other different sites to write articles then they will hire you and they will pay you too for that. At the start, It might be possible for you that you're not writing good. But don't worry, when you'll be in practice then your writing skills will also increase as well. Well! for your help, here I shared some article links to write attractive and best articles. Must read them and make yourself like a professional. This way is for those who think they are confident and best in presentation. Lots people are there on Youtube who are making money. They actually have grown their channels from videos that's why they have visitors and subscribers to watch videos. That's why Adsense Ads are monetized on their channels and they are earning from it. Actually, Youtube is one and only place which offers to monetize videos with Adsense. What is Adsense? do you have this question? Alright, if you know about it, so that's great, but if you don't then visit this link and read this. So, you can create a channel on different categories like tutorials, reviews etc. If you're gamer then you can also create your own channel. You can record and upload gameplays of different games and then you can earn. If you're a programmer or know about coding then you can this way is just for you. In this way, just take the project, build it, test it, submit it and get the payment. That's all. It does not matter which language or coding or platform you can work on, you can find jobs for all. Freelancer website does the job of connecting programmer's with clients. Similarly, you can also submit your skill to different sites like fiverr.com etc. These websites have such customers who need people like you. So, if you think you can do this work or you are perfect for it then start making money from today. Also learn more and build your skills as well. If you're not fit with all above then work as a website or domain seller. This is very easy. You won't have more work to do and you can earn money. Simply, buy domains with different unique names and then sell to people with your comission or profit. Just invest money at start and then grow foundations of your business as professional. There are several websites to buy domains or get hosting. Go daddy, Host Gator, Name Cheap, Big Rock are one of them. It might be possible that you're not aware about domain and hosting. So to know about it in deep, visit this link. Hope, this will enough for you to understand about them. So guys these are some brilliant ways to make money online at home. I know, these ways may also be hard or difficult for you. But remember, every work requires hard work. So to start online business, you must have to do work hard at start. So must try these ways and don't forget to share this article, if you find help here. Must share your own ways also via comment below. Yes! That's why it's on the top in above list. I have been using Adtomatik for two months ago and I have given very good results, with them I received advice to improve monetization with highly effective strategies such as image ads, native ads, etc. Thanks for your recommended Ads monetizing site. I was sitting at home without job for almost a year, but that all changed when I met with this => fb.me/OAYtWsMf website. Now I earn up to $ 80 per day sharing my opinion. I continue to stay at home, but now I earn up to $2400 per month from home. NO attachments, and REAL earnings.This work is suitable even for those who knew nothing about computers and never earned online. I advise everyone who wants to constantly and honestly to earn money to visit => fb.me/OAYtWsMf Good luck! Yeah! online coding is really good.